647 pages | 49 B/W Illus. Winner of the 2017 AERA Division D Significant Contribution to Educational Measurement and Research Methodology Award! Technological and statistical advances, along with a strong interest in gathering more information about the state of our educational systems, have made it possible to assess more students, in more countries, more often, and in more subject domains. 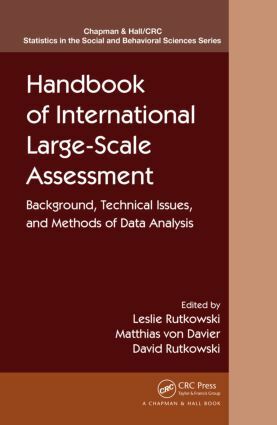 The Handbook of International Large-Scale Assessment: Background, Technical Issues, and Methods of Data Analysis brings together recognized scholars in the field of ILSA, behavioral statistics, and policy to develop a detailed guide that goes beyond database user manuals. After highlighting the importance of ILSA data to policy and research, the book reviews methodological aspects and features of the studies based on operational considerations, analytics, and reporting. The book then describes methods of interest to advanced graduate students, researchers, and policy analysts who have a good grounding in quantitative methods, but who are not necessarily quantitative methodologists. In addition, it provides a detailed exposition of the technical details behind these assessments, including the test design, the sampling framework, and estimation methods, with a focus on how these issues impact analysis choices. "This book is an excellent resource and guide to international large-scale assessments, or ILSAs. The three editors have done an excellent job identifying a group of prominent scholars whose expertise ranges from international testing and behavioral statistics to educational policy. … a seminal source for any university faculty teaching in an educational or psychological measurement program. … a truly monumental effort and all of the authors are to be applauded for their clarity, thoroughness, and didactic approach in explaining what, in many cases, is complex psychometric or sampling theory."